Now that #tnks has been out for a month, here is a compilation of few reviews / comments I have received. NOTE: If you want to read the book, review it and put in on your blog, please contact me. I still have permission to send some ebooks. For the paperback version, we will have to wait for the next print run. Thanks! As on 21 Dec 2014, #tnks has 28 ratings and is at 4.29. Which to me, is pretty crazy for my first book! 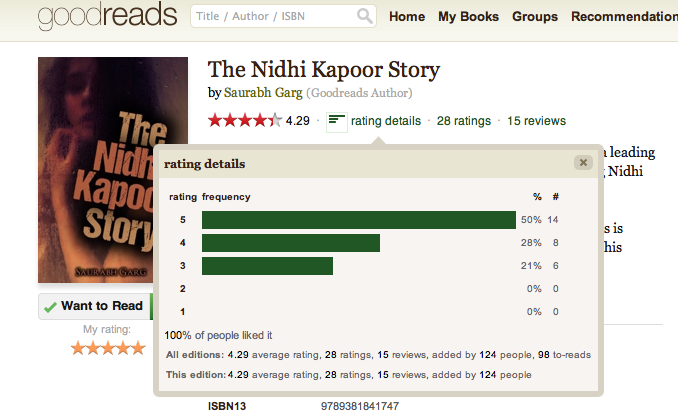 More on the #tnks Goodreads page. Whoever has read #tnks, they have told me that they haven’t been able to put it down. I think of this as a good thing and a bad thing. Good: The story is captivating. Bad: The story does not make people think! According to whoever has read the book, the characters, plot and the context is very well researched. Most people (more than 80%) like the book. For a first-time author, it’s a huge thing. Oh, and everyone tells me of a few bugs that have crept in the book. A list of bugs is on the errata page. In the next editions, we will edit those bugs. Most readers have asked me to chase writing as a career. They believe that my stories are interesting and more people ought to read those.